The College of Science, Engineering, and Technology Office of Student Services and Instructional Support (OSSIS) has established two programs designed to help new freshmen and transfer students with the best opportunity possible to succeed in college. OSSIS is continuing its mission to help retain students within the College who may otherwise have dropped out due to poor grades or changed majors due to the rigors of a STEM program. COSET’s newest pilot program is COSET Connect or COSET First Generation Tigers which matches first generation Tigers with the Dean, Department Chairs, and faculty members to increase progression and retention among students who are the first in their families to attend college. A group of 10 students meets with a member of the COSET faculty once monthly and via email to discuss issues of concern to them and to share. Our team is eager to help students and are committed to the task. It is the goal of the program for COSET students to develop the self-motivation and self-discipline necessary to succeed in college. COSET is proud to enter into the 3rd year of the COSET 101: Freshmen Meeting, designed to promote student success, persistence and retention. Because many students enter college not fully knowing all it entails to be successful in college, this course was designed to help bridge the gap between the skills the student brings to college and what they need to know to be successful (academic skills vs. the non-academic skills.). On the fourth Wednesday of each month, the OSSIS team hosts a COSET 101: Freshmen Meeting focusing on different topics that entering students need to be aware of in order to be successful. Topics included adjusting to college life; time management; how to study/note-taking strategies; creating a study pact; general education requirements; career planning; and other campus resources to name a few. Over the past couple of years the Freshmen Meetings have grown and now include students on every level who have the desire and will to learn more. 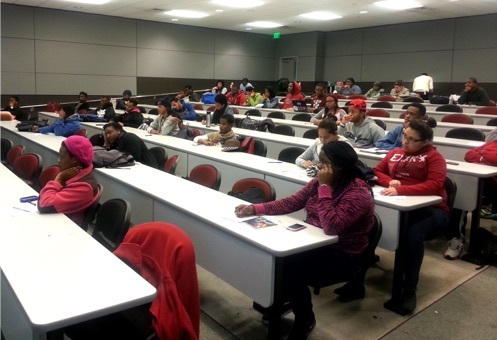 Additionally, the attendance to the meetings have also increased from 39 to over 100 students. Although, COSET 101 began in COSET it is only a success due to the efforts of the Texas Southern University family who have committed themselves to ensure our students do well both academically and in life.